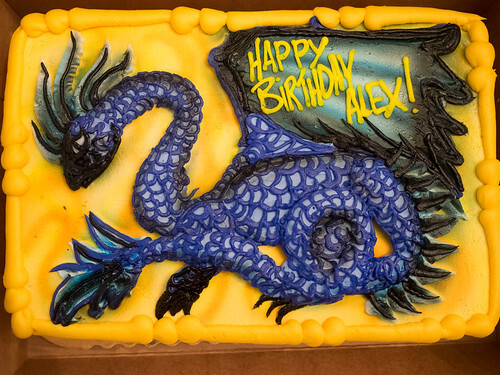 The phone started ringing at 7:00 AM last Thursday, as distant relatives wanted to wish Alex a happy birthday. “Does it feel any different to be nine?” Grandmom asked. These days, I have a hard time writing anything about birthdays (one of the reasons it took so long to write anything at all). The kids’ first few birthdays feel amazing. “Oh my God! I successfully kept this thing alive!” Now things are on autopilot. Alex on March 18 isn’t noticeably different that Alex on March 19. A eight-year-old in the house doesn’t feel different than an nine-year-old in the house. What is there to write about now that our lives just gradually accumulate small changes? Why pick this day to celebrate out of the steady stream of days? Well, whatever the answer to that question, Molly planned another great party this year — lots of jumping at Elevated Sportz. The kids all had fun and the birthday boy felt special. Maybe that’s all that needs to be said.